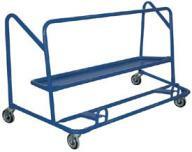 Heavy duty steel platform cart supports multiple sizes of sheet material such as paneling, plywood, drywall or anything that is long, bulky and hard to handle. Ideal for lumberyards and harware stores. Rolls on (4) 6" x 2" swivel poly on poly and (2) 8" x 2" rigid poly on poly casters. Center caster provides great maneuverability. This industrial panel cart is perfect for moving your plywood, or other forms of lumber. A convenient, removable plastic basket is included for carrying smaller items and tools. Rollers are provided on one end for easy loading and unloading.Two rigid and two swivel 4" x 2" phenolic casters are included. Steel construction, powder coat blue finish. Over all height is 40 1/2". Assembly required. 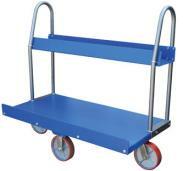 You get double your moneys worth with this Heavy Duty Panel Cart. 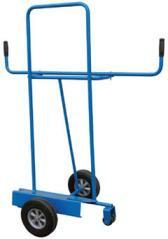 Not only is it the perfect panel cart for transporting plywood, drywall, paneling, doors, etc. ; it transforms into a platform truck when you remove the 27" high support rails. 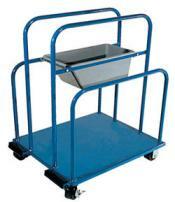 This cart is powder coated blue and features a side retainer lip that keeps cargo on the deck. Two rigid and two swivel 5" x 2" poly on steel casters included. Overall height is 34". Assembly required. Unique design saves valuable space when stored. Overall size of each cart is 72-1/2" wide by 32-1/2" deep by 39-1/2" high. Each additional cart only requires an additional 10-1/2" of space. Features front storage area for handling panneling and sheet goods. Rear shelf is ideal for storing smaller products. Each unit includes (4) 5" x 1-1/4" poly on poly swivel casters; one with a total locking brake. Welded steel construction. Powder coat blue finish. 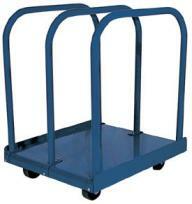 This two tier cart is great for handling panels and small items. The top dock is 30" high while the bottom dock is 8" off the ground. Four sliding posts can be locked in the up position to prevent products from sliding. Rolls on (4) 5" swivel and (2) 8" rigid casters. Center caster provides great maneuverability. This hand held panel cart is ergonomically designed for quickly and easily moving sheets of plywood or drywall down small aisles or through doorways. To prevent tipping, rollers have been added to the front and the back of the unit for support. Includes (2) 10" x 2-1/2" and (2) 4" x 1-1/2" solid rubber wheels standard. 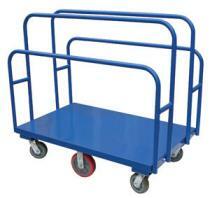 This heavy duty panel truck has a built in storage tray for use with sheet and panel goods. It is great for use in home centers, warehouses and similar locations.